Trying to learn important information through multimedia can feel like driving through a strange city for a big job interview. As the learning designer, you’re not the one heading to the interview, but you do select the car and choose the route. You not only give directions, but also mark the lanes, erect street signs, and string up the traffic signals. Whatever roads and vehicles the driver encounters, you put there. And if you make mistakes, the driver won’t arrive on time or do well in the interview. Research suggests—with a very loud “ahem!”—that multimedia razzle-dazzle can actually work against effective learning. Even background music can interfere with success, the way sound from the car radio makes it harder for you to navigate through a work zone. In “Nine Ways to Reduce Cognitive Load in Multimedia Learning,” Richard E. Mayer and Roxana Moreno explain what they mean by cognitive load and offer a three-part theory for how to make information meaningful. Multimedia learning, according to Mayer and Moreno, involves delivering information through words (printed or spoken) and images (drawings, photos, animations, videos). By “meaningful learning,” they mean you’re able to apply that information to a new situation. The dual-channel assumption says that we handle incoming information through two channels: one for words and one for images. The active processing assumption says that we need to do significant mental work in order to learn. We decide what to pay more attention to. And, for things that make the cut, we go on to figure out what they mean and how they interact. This processing is how we create a mental construct for what we’re learning, and connect that construct to existing knowledge. The limited capacity assumption says that we can only work with so much at a time in a cognitive channel. We can only handle so many words or so many images at a time. Assuming you’ve done some active processing with those three points, you can already see the implications. Learning is challenging enough; the way we present information through words and images can help or hinder. Mayer and Moreno also identify five ways overload can happen, and they present strategies to overload. I’ll discuss three here, and two more in the next post. Imagine that a section of your multimedia lesson has most of its information in a single channel–say, a large block of text. Let’s say it’s all necessary information. In fact, because it’s necessary, you decide to include a voiceover to reinforce the print message. You’re asking the learner to read and listen at the same time. The two streams of verbal information — printed text and spoken words — compete for working-memory resources and can overwhelm the verbal channel. 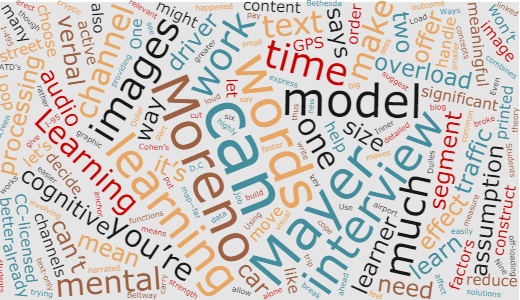 Assuming all the information truly is relevant, Mayer and Moreno suggest off-loading some content: move some from verbal to visual. Use images to anchor key concepts, reduce the printed text, and let the audio channel carry the message. “Students understand a multimedia explanation better when the words are presented as narration rather than as on screen text,” write Mayer and Moreno. Remember our interview candidate? She navigates traffic more smoothly with a GPS that combines spoken directions with a graphic map—far more so than if she had highly detailed, text-only directions. What happened in the researchers’ experiments? One way to express the strength of an outcome is through “effect size.” Using one common measure, Cohen’s d, an effect size of 0.1 – 0.3 would be small, 0.3 – 0.5 would be moderate, and greater than 0.5 would be significant. * In six experiments involving offloading, Mayer and Moreno report an effect size of 1.17. * In Cohen’s terminology, a small effect size is one in which there is a real effect — i.e., something is really happening in the world — but which you can only see through careful study. A ‘large’ effect size is an effect which is big enough, and/or consistent enough, that you may be able to see it ‘with the naked eye’. What if both channels, verbal and visual, have too much essential information? No matter how much you need to cover or how elegant the presentation, too much is too much. When the learner can’t process everything, she can’t organize the input into a useful mental model, let alone integrate it with what she already knows. Again, our driver trying to make the interview can’t easily cope simultaneously with a nagging GPS, unfamiliar street signs, shifting traffic, and a message board displaying cryptic data about a detour—even though it’s all important. Mayer and Moreno offer two solutions. One is to segment content; break material into smaller pieces, and allow the learner to decide when to move on. An experiment broke a three-minute segment into 16 segments, linked by CONTINUE buttons. Compared with a control group, students who could choose when to continue, thus taking the time they wanted with the current segment, performed substantially better. When segmenting won’t work, a second solution is to offer pre-training, which means providing some information ahead of time, such as the names or functions of major parts. In order to build a mental model of what you’re learning, you need a component model (how each major part works), and a causal model (how the parts affect each other). Pre-training gets you to the component model faster so it’s easier to construct your causal model. Suppose our interview candidate has traveled to Washington, D.C. Before she gets her car, she might learn the different names for the most important freeway (I-495, I-95, the Beltway) and the meaning of “Inner Loop” and “Outer Loop.” That could help her negotiate the trip from Dulles airport to Bethesda.